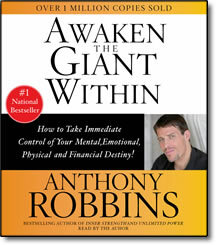 Awaken the Giant Within – Audio by Anthony Robbins – Discount! Learn how to take immediate control of your mental, emotional, physical and financial destiny. Anthony Robbins, the nation’s leader in the science of peak performance, shows you his most effective strategies and techniques for mastering your emotions, your body, your relationships, your finances, and your life. Anthony Robbins has unlocked the personal power inside millions of people worldwide. Now, in this revolutionary new program based on his enormously popular Date With Destinyseminars, Tony unleashes the sleeping giant that lies within all of us–teaching us to harness our untapped abilities, talents and skills. The ultimate program for imporving the quality of every aspect of your life—personal or business, physical or emotional—Awaken the Giant Within gives you the tools you need to immediately become master of your own fate.